Lava spattering from an area between active Fissures 16 and 20 on May 16, 2018. 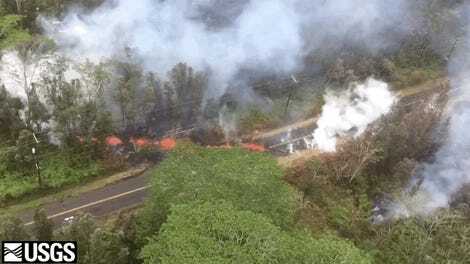 As if the residents of Hawaii’s Big Island don’t have enough to worry about already, the US Geological Survey is now warning residents of yet another threat: large rocks shooting from Kilauea’s crater. Several rocks, including one measuring two feet wide, have already fallen— but the situation could get even worse. It’s been two weeks since Hawaii’s Kilauea volcano began erupting, and there’s no apparent end in sight. At least 17 fissures have been recorded in the volcano’s East Rift Zone, and ash plumes from the crater are raising the possibility of acid rain and volcanic smog, or “vog,” packed with noxious sulfur dioxide. 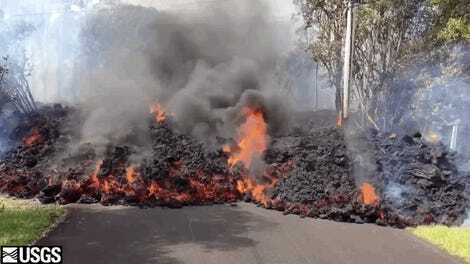 The US Geological Survey (USGS) is warning that the eruption is still evolving and additional outbreaks of lava are possible, along with ongoing ground deformations and earthquakes. Earlier in the week, ash emissions from the Kilauea summit reached as high as 10,000 feet above sea level, causing headaches for both residential neighborhoods and airlines. The cloud drifted downwind from the volcano, dropping dust on communities from Pahala to Discovery Harbor. On Wednesday, a 4.2-magnitude quake shook the region in the early hours—and then the sky began to fall. “This morning dense ballistic blocks up to 60 cm (2 feet) across were found in the parking lot a few hundred yards from Halemaumau,” wrote the USGS in its advisory. “These reflect the most energetic explosions yet observed and could reflect the onset of steam-driven explosive activity.” Halemaumau is an active pit crater nestled within the larger summit caldera of Kilauea. No damage or injuries have been reported, but the USGS is closely monitoring the projectile rock risk. Additional steam-driven explosions are expected, and it’s possible they could be even more powerful. It’s been nearly a century since KIlauea has hurled rocks like this, according to the USGS. Sulfur dioxide plumes rising from fissures along the rift and accumulating in the cloud deck. 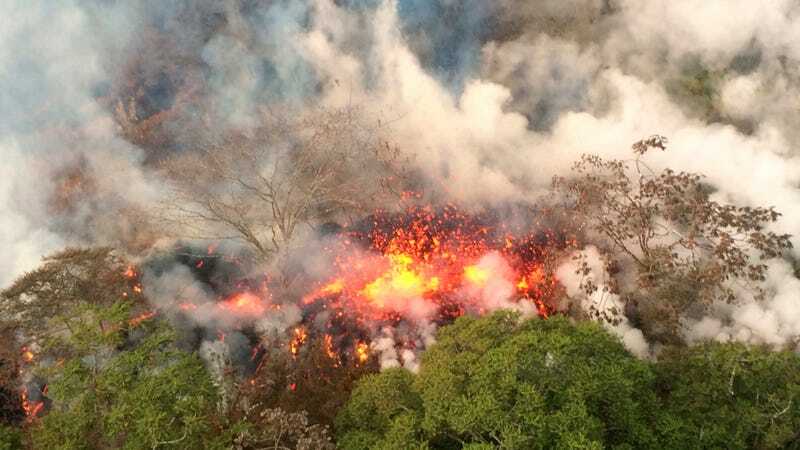 Since Kilauea began erupting on May 3, dozens of homes have been destroyed, and hundreds of people have been evacuated. The lake on the summit is still in the midst of deflating, heightening the risk of violent explosions.